Several years in the making, the U.S. Environmental Protection Agency (EPA) electronic hazardous waste manifest (e-Manifest) system is scheduled to launch on June 30, 2018. This modernized system will facilitate electronic submission of hazardous waste manifests through a uniform national program covering all federal and state wastes requiring manifests. Once implemented, the system should reduce costs and effort required to prepare and handle paper manifests by hazardous waste generators, transporters, and treatment, storage, and disposal (TSD) facilities; produce more accurate and timely waste shipment information; allow for quicker notification of manifest discrepancies; and establish a single on-line repository of manifest data for EPA, states, regulated entities, and the public. EPA estimates that three to five million paper manifests are produced annually. Roll-out of the system will culminate a decade-long process that accelerated in 2012 with enactment of the Hazardous Waste Electronic Manifest Establishment Act (e-Manifest Act) authorizing EPA to work with industry and states to implement a national electronic manifest system. EPA published a final rule in 2014 that, among other things, recognizes e-Manifests as the legal equivalents of paper manifests, allows electronic signatures, and authorizes transporters and TSD facilities to accept e-Manifests in lieu of paper forms. Use of e-Manifests will be optional (other than for receiving facilities) but strongly encouraged by EPA. The e-Manifest Act also authorized EPA to collect reasonable user fees to develop and maintain the system. 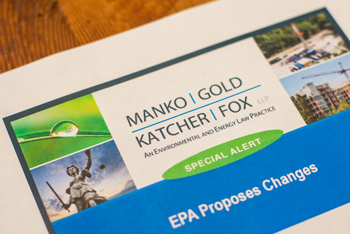 On January 3, 2018, EPA published a final rule establishing the user fee methodology. The fees are intended to cover costs to develop, operate, maintain, and upgrade a national e-Manifest system, provide public access to the data, and collect and process data from any paper manifests submitted after the e-Manifest system begins to operate. A copy of the user fee final rule can be found here. Anticipated fees will primarily be the responsibility of receiving facilities and are tentatively set to range between $4 and $20 per manifest submittal. EPA will have the authority to seek sanctions for non-payment of user fees. The final rule also addresses some non-fee issues, including for example establishing a process for correcting erroneous data and restricting public access to certain manifest data for chemical security purposes. EPA has been conducting outreach on the e-Manifest system through a website, webinars, stakeholder meetings, and other methods. The agency has also been helping states prepare for launch, including aligning state manifest practices with the new system, adopting the federal rules, and engaging regulated entities. In the coming months hazardous waste generators, transporters, and TSD facilities should look for more information and training opportunities from EPA and state agencies to be prepared when e-Manifests go live this summer.